"Set Safety Distance for Wind Turbines"
My Tuesday lunch meeting on campus just a few minutes minutes prior to the scheduled press conference of fourteen NGO and civil organizations before the "Experimental Hearing on Safety Distance on Wind Machines". The event was sponsored by the Ministry of Economic Affairs (經濟部) and hosted by the Bureau of Energy (能源局). Since I investigated and wrote about the issue of wind turbine distance and the Yuanli Township resident's struggle with government agencies and the German wind power company, InfraVest, over the company's endeavor to erect wind turbines the residents claim to be too close to their homes, I rushed across campus to check things out. Upon arrival, I observed the Yuanli Township residents and representatives from environmental and human rights NGOs were already there. I walked into the lobby of the lecture hall and saw one can sign up to attend on site, so I did. There were also quite a few individuals standing and sitting in the lobby already. Strangely, most of them were either playing with the cell phones or just standing around, not speaking to anyone, looking bored. I then discovered these individuals were all there to sign up as speakers at the hearing. The organizer would not let me take a photograph of the roster, but there were quite a few "Vest (威)", as in "InfraVest", as part of those individual's affiliated companies. (Note: InfraVest has different affiliated local companies for all its local projects. For example, the local company responsible for the project in Taoyuan County would be called "TaoVest (桃威)". In the case of Yuanli, the local InfraVest company is called "TongVest (通威)" in reference to the Tongxiao Township). After the experimental hearing started, I examined the seats for the speakers, quite a few individuals I saw in the lobby were nowhere to be found. As the press conference went on, I saw a dozen police officers arrive on scene and move into the lecture hall where the "hearing" was. The atmosphere immediately tensed up when the police officers arrived. Participants looking at each other, probably wondering the same thing I was questioning in my head, is there a need for this much police presence at an experimental hearing about wind machines? Are they here because the residents of Yuanli are here? As the press conference ended, I walked into the lecture hall to find a seat. I entered the lecture hall and discovered there were police officers, CID officers, campus security as well as individuals with "work badges" standing all around the room. One would assume some high level government official was going to be present at the experimental hearing for the organizers to have such large presence of security. This is grounds for grave concern, as the large police presence would ultimately intimidate ordinary citizens who would otherwise express their opinion on the issues to be discussed. I'm not sure keeping citizens at bay was what the host of the event intended, but the large presence of police officers was entirely unnecessary and inappropriate. It also demonstrated the Bureau of Energy's insensitivity to citizens and lack of awareness on the importance and guarantee of participation in democracy. And, it gets worse, as the experimental hearing proceeded, the CID officers station at both sides of the lecture hall filmed those who raised their hands to question the legitimacy and procedural flaw of the experimental meeting. I naturally assumed the CID officers would turn their camera on everyone who spoke; however, I observed them placing the majority of their concentration filming the participants who were raising question about the experimental hearing, the Yuanli Township residents and their supporters. Even though the CID officers left after the first session, they have already effectively planted the seeds of intimidation in the minds of hearing attendees, as the attendees understood their faces were already documented camera. As many of the participants pointed out, the Bureau of Energy only sent out notice for the experimental hearing less than five days prior to the hearing, so many organizations and individuals who have employed felt they did not have ample time to prepare for the hearing. Moreover, the presiding chair of the experimental hearing was the Deputy Bureau Chief of the Bureau of Energy, and the rest of the panelists were also from the same Bureau. There were no independent expert on the panel. Then, how does one have a productive discussion on safety distance of wind turbines? The organizer did not have an answer. As the hearing went out, I realized the government bureaucrats had little or no idea which articles of the Administrative Procedure Act (行政程序法) to follow, as all government sponsored hearing should. The chair of the hearing kept referring to his subordinate associate to answer the audience's questions. I felt like, since this is ghost month, I was experiencing the "ghost maze (鬼打牆)", which is the traditional belief that a ghost was trying to manipulate one's senses, so one feels like she is in trapped in a maze, encountering similar and repetitive paths but can't get out. The chair and his associates kept mentioning the President's Human Rights Advisory Committee as basis and reason for the experimental hearing. 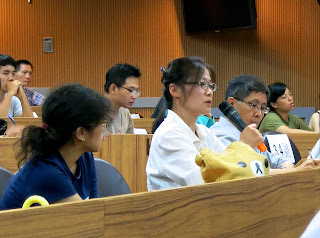 Then, when the audience question the legitimacy of the hearing and whether the conclusion of such hearing is binding in any way, the chair said, since Taiwan has no regulation for safety distance of wind machines, the was no need for such hearing but the experimental hearing would follow the Administrative Procedure Act. Then, the MC intervened and answered the participant's question that the hearing didn't have to follow the Administrative Procedure Act, because the government didn't legally have to have the hearing in the first place. Confused yet? And this was all prior to the registered speakers spoke. When questioned again on why the Bureau of Energy decided to hold the experimental hearing, the panel again referred to the President's Human Rights Advisory Committee's recommendation to have the hearing and admitted the discussions of the experimental hearing would be documented as reference if the government ultimately decides to consider implementing any policy regarding safety distance for wind machines in Taiwan. Ironically, the information document the Bureau distributed to hearing participants was titled, "Experimental Hearing on Policy of Safety Distance for Wind Machines" yet the hearing will have no effect on policy. The audience had a point. Safety distance of wind machines is an important issue that affects all - the residents living near the wind machine, the environment, Taiwan's source of energy and those who are in the green energy business. It became quite clear, after all the discussion, that the experimental hearing was not binding at all, and what was said during the hearing, while being recording, might be forever tucked in the back of the government's public document archive. At this point, a lawyer proposed the motion to end the hearing on the spot and have everyone come back when the government officials were more aware of which procedure to follow and for what purpose the hearing is held. Some audience members seconded the motion, but the presiding chair overruled it and insisted to proceed with the experimental hearing. "This is a waste of everyone's time! ", Wang Yun-yi, the Vice President of InfraVest exclaimed. "No, it's not" said Echo Lin from the Environmental Jurists Association, "Hearing procedure is an important issue and a problem for this event, and we need to sort things out first before anything can proceed". The experimental hearing proceeded as the presiding chair wanted. As expected, it became a vent-fest for all parties involved, from township residents, NGO group members and wind power company representatives. My experience as the experimental hearing raised serious doubt in my mind on the sincerity of the administration to address the issue of green energy. If the administration endorses green energy, as President Ma said when he visited the wind farm in Penghu a few weeks ago, then the Ministry of Economic Affairs should take the safety issue of wind turbine seriously, as there have been conflicts between wind power companies, the way those companies conduct themselves in townships and the residents living in close proximity of those wind machines. MOEA, EPA and the Bureau of Energy are all aware of this on-going issue, yet only non-binding experimental hearings here held without discussion the extent to which the government agencies would push for any policy regarding safety distance or address the dwindling land mass to erect any more wind turbines. I see the struggle for the township residents continue, as the environmental and anti-nuclear energy groups agonize over the the advocacy of and push for green energy, and the government, once again, remain stagnant. It is my sincerely hope that, after all the questions raised and discussion on transparency and procedure, the officials who were present at the meeting would learn something and make the necessary improvement for the next formal public hearing on this issue. 1) The Yuanli Township residents sued InfraVest Wind Power Co. for infringing on the quality of their lives in April, and they asked for the court to order InfraVest to stop building additional wind turbines in their town. The first day of court for the Yuanli residents was yesterday. You took photographs of the hearing, so they didn't bar people from bringing cameras inside. Might it also have been possible to take pictures of the individual police and CID officers who were doing the filming?